In 2015, Google announced that the number of searches on mobile and tablet devices have surpassed desktop searches. With this new revelation, we can see that mobile usability in web design is more important than ever. Google even released a mobile-friendly algorithm update that gives preference to websites that have a mobile site or mobile friendly design. With the growth in mobile usage, UX/UI Designers or User Experiencers/User Interface Designers are becoming more and more sought after by companies. UX design focuses on the interaction between the user and the website and whether or not this interaction is visually and mentally satisfying. A UX Designer must be aware of the contextual information and how content will fit into it. 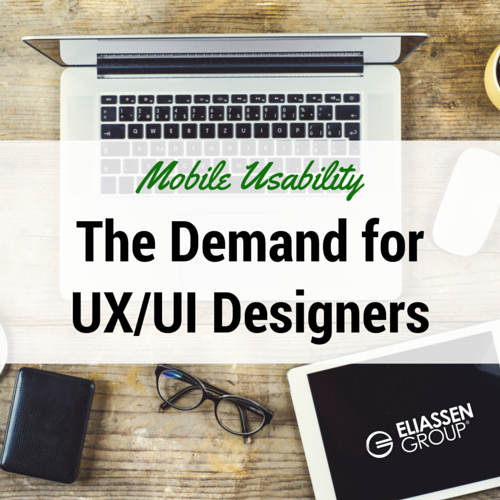 This growing trend in mobile usability has opened up the job market for UX/UI Designers. The demand for these positions is higher than ever and is only expected to grow in 2016. So how can you break into the field to take advantage of this growth if you don’t have formal training? A recent article by VentureBeat highlights coding bootcamps for which prospective UX/UI Designers can register. These are offered in live classroom settings, as well as online courses. Further, a Course Report survey of 432 bootcamp graduates found that 69 percent of those who had no programming experience prior to enrolling in the course landed full time jobs in tech companies after completing the session. And those who may have had some experience but then attended a bootcamp were able to recognize salary increases and full-time employment. Do you have questions about UX and UI Design positions? Eliassen Group can help you find new career opportunities! Give us a call at 800-354-2773 for more information or email us at solutions@eliassen.com.